But that was not all. Schumer drew a line in the sand by warning that he would seek to attach riders to important bills coming up in Congress this month to block the commission: “If the president does not act, the Congress should prohibit its operation through one of the must-pass legislative vehicles in September,” he wrote. That could include a host of measures, such as a children’s health care program, a flood insurance reauthorization program and a bill for the Federal Aviation Administration. Schumer didn’t say exactly how far he’d go to achieve that goal. A senior aide said the senator was still mulling which piece of legislation he’d seek to attach the language to. The latest skirmish comes as the 12-member panel — officially known as the Presidential Advisory Commission on Election Integrity (most everyone is now calling it the Pence-Kobach Commission, as the vice president is the chairman), is set to meet in Manchester, New Hampshire, on Tuesday. It’s no shock that matters have come this far — the panel is seen by most in Washington as a blunt instrument, an unsubtle creation with a single-minded purpose: to justify yet another wild claim by the president. In November, Trump said millions of illegal votes were the reason he lost the popular vote to Hillary Clinton. He later told congressional leaders that he believed the number of fraudulent votes was as high as 5 million. His source for that claim was an obscure former Texas official named Gregg Phillips, whose group, “True the Vote,” acknowledged this summer that it didn’t have the goods and probably never would. Kobach, a Republican running for governor in Kansas, has refused to cast any doubt on Trump’s claims, and in a July interview with MSNBC, he said “we may never know” who won the popular vote. In November, in certifying his state’s election results, he actually went further, saying, “I think the president-elect is absolutely correct when he says the number of illegal votes cast exceeds the popular vote margin between him and Hillary Clinton at this point.” Academic studies and federal investigations have found little in the way of voter fraud like ballot-stuffing and coordinated efforts at cheating, and even less when it comes to in-person voter fraud — a topic the commission seems keen to examine. On Thursday, Kobach penned a piece for the far-right Breitbart News, alleging there was “proof” out-of-state voters had swung the Senate race in New Hampshire that culminated in the election of Democrat Maggie Hassan, and that it was “likely” that “the election was stolen through voter fraud.” Election officials in New Hampshire, whose information Kobach cited to make the allegation, responded that they have no reason to question the legitimacy of the election. Unsurprisingly, liberal activists and voting rights advocates have called the panel a “sham” and “dangerous” and “the vehicle for voter suppression.” Conservative groups, on the other hand, feel like the actions of the commission and Trump’s Justice Department are long overdue. But how dangerous is this commission, really? On the one hand, Kobach is right, the panel has no power to do anything except collect data and write a report offering recommendations. But a good number of voting experts are fearful that Trump’s constant drumbeat of “fraud,” as well as a report from the commission that produces stunning numbers that might prove later to be wildly inflated could prompt states to enact stricter laws. There’s also a fear that Kobach’s desire to amend the National Voter Registration Act of 1993 (known as the “Motor Voter” bill) would put up additional hurdles to voting. Congress would need to act on this front, and while a standalone bill would likely meet failure, some observers don’t rule out an attempt to attach changes to the NVRA in a must-pass bill. On top of all this, the Supreme Court will hear a case this fall that is at the heart of what the commission is looking at — the purging of voter rolls in a case in Ohio. The commission got everyone’s attention weeks before its first public meeting, when on June 28, it requested voter information from all 50 states and the District of Columbia, a request that was met with bipartisan backlash and lawsuits. On that same day, the Justice Department sent a letter to 44 states seeking, among other things, information on how they have fared on removing ineligible voters from state rolls — a request that raised eyebrows not only for the timing, but because it swept in so many states and narrowly targeted one section of election law. “How can I assure the people of Maine that I’m going to keep their information from being released in a way that causes them discomfort or harm?” Dunlap said. Kobach said the information will be kept under tight seal by the commission and will be deleted afterward. Hans A. von Spakovsky, a commission member, said that if states do not comply with the request, he will recommend that the commission ask Attorney General Jeff Sessions to compel them to release the information. “If they continue to refuse to cooperate, I’m going to urge that we recommend that the Justice Department go after them to comply with federal law, which requires them to provide this information,” he said. Kobach wouldn’t rule out that approach, but said he is taking more of a wait-and-see attitude for now. If the commission were to recommend going that route, it would likely set off alarm bells among voting rights advocates. As vice chairman of the commission, Kobach is a lightning rod — and probably for good reason. His efforts in Kansas have placed restrictions on voters that go far beyond most other states. The U.S. Election Assistance Commission, an independent federal agency, found in August that Kansas had one of the highest number of rejected ballots in the country in 2016 — only six other states threw out more ballots, even though Kansas is the 33rd largest state by population. Kansas also has some of the tightest voting laws in the country, and Kobach is the only secretary of state in the country with the power to prosecute voter fraud. Right now, Kobach is defending the state in a federal lawsuit over whether Kansas can require residents to show proof of citizenship before being registered. In November, Kobach was photographed walking into a meeting with Trump carrying a memo that suggested he intended to seek changes to the NVRA that could allow states to require proof of citizenship. He was recently fined $1,000 by a judge for “deliberately attempting to mislead the court” over the nature of the documents. He has repeatedly claimed that voter fraud is rampant, going so far as to accuse a living man of voting while dead. When a reporter found the accused in his front yard raking leaves, the man famously quipped, “I don’t think this is heaven.” For all his efforts, over the past five years, Kobach has successfully prosecuted just nine cases of voter fraud, one of which was an unauthorized immigrant. In August, the Kansas City Star revealed that Kobach had taken a paid gig as a columnist for Breitbart News. When it comes to something to hide, the tables were turned on the commission in late August, when a federal judge smacked around the panel for failing to live up to a promise to release documents and memos ahead of that meeting. The Justice Department lawyer defending the administration explained that the commission was basically a mess. “It was a chaotic start to the commission,” Elizabeth Shapiro admitted. At its first meeting, some discussion revolved around increasing turnout and cybersecurity, but it was clear that the overriding concern of the commission was figuring out ways to determine whether fraud actually exists. Von Spakovsky made suggestions to look into various databases — essentially to see what states use to keep their rolls up to date. The panel is also interested in finding instances in which elections were decided by a small margin of votes. Kobach instructed staff to compile a list of close elections. This is not a small point. Most election experts say fraud of some sort exists, be it with absentee ballots or double-voting, just not on a widespread level that could actually turn elections. But some on the commission believe that is an incorrect assumption. Christy McCormick, a member of the panel who is also a member of the Election Assistance Commission, said during July’s meeting that “impersonation voting” was far more common than believed. “I know from personal experience and of seeing it in person myself — that it is not a myth,” she said. In an interview with Breitbart radio in July, Kobach pushed the same line. “In a close election, these instances of fraud can steal the election — can shift the results,” he said. As part of its efforts, the commission will also likely be taking a closer look at a report produced by a think tank co-founded by former White House chief strategist Steve Bannon. That report, released in July from the Government Accountability Institute, found 8,471 cases in 21 states of potential duplicate voting during the 2016 election. Von Spakovsky, writing in The Daily Signal, the Heritage Foundation’s news site, called the report a “bombshell.” Kobach has spoken of it favorably. The author of the report is Ken Block, a former Republican candidate for governor in Rhode Island. He told CQ that once he got voter rolls for those states, he did an initial comparison, then used credit reporting data, Social Security Administration information and other information such as magazine subscriptions to refine the matches. He figures that a 50-state study would likely reveal “at minimum” 45,000 double votes in 2016. Block declined to release his data, but said the study is a rebuke to those who say voting fraud is rare. “If nobody has really properly looked for it, that doesn’t mean it doesn’t exist,” he said. “In other words, it means that nobody has done a really good job looking for it.” Block is slated to testify before the commission on Tuesday. Some right-leaning groups see the actions of the commission and the Justice Department as long overdue. He and his group have accused various states of having more registered voters on their rolls than voting-age citizens. This year, Judicial Watch sent letters to 12 states, most recently California, warning them of legal action if they did not make “reasonable” efforts to clean up their rolls under the NVRA. California has not yet decided how it will respond to the letter. In 2015, Larry Harmon, a retired Navy officer and software engineer from suburban Akron, Ohio, wanted to vote against a ballot initiative that would have legalized recreational use of marijuana. A registered Democrat, he was leery of a provision that would have given a production monopoly to a limited number of investors who were helping bankroll the effort. Harmon, who had been living at his home for 16 years, showed up to vote at the local high school. He was told he was no longer on the rolls and couldn’t vote. The problem, he later found out, was that he hadn’t voted since 2008. According to state officials, he had been removed because he had not voted in two consecutive elections and did not respond to a mailing from the state seeking to affirm his status. Harmon is now a plaintiff in a case that the Supreme Court will hear this fall, Husted v. A. Philip Randolph Institute, which could have wide-reaching implications for voting rights. The case could impact hundreds of thousands of registrations in Ohio that the state was attempting to purge. In August, the Justice Department reversed its stance under the Obama administration and backed Ohio in the case. What happened to Harmon is similar to the experiences of many others across the country. Some states, and legal groups on the right, have been particularly aggressive about scouring voter rolls for what they say is “deadwood.” J. Christian Adams, a member of the commission and a former Justice Department official, is part of a group called the American Civil Rights Union that has sued multiple jurisdictions around the country in an effort to purge what they say are ineligible voters from the rolls. And for the most part, they are within their legal right to do so. Section 8 of the Voter Registration Act explicitly lays out how states can remove voters like Harmon from the rolls. It was that section the Justice Department was focusing on when its letter was sent out in June, and it is why voting rights groups are fearful that it could trigger further action from the federal government. For years, voting experts have eyed a compromise solution — one that would satisfy security and access advocates alike. 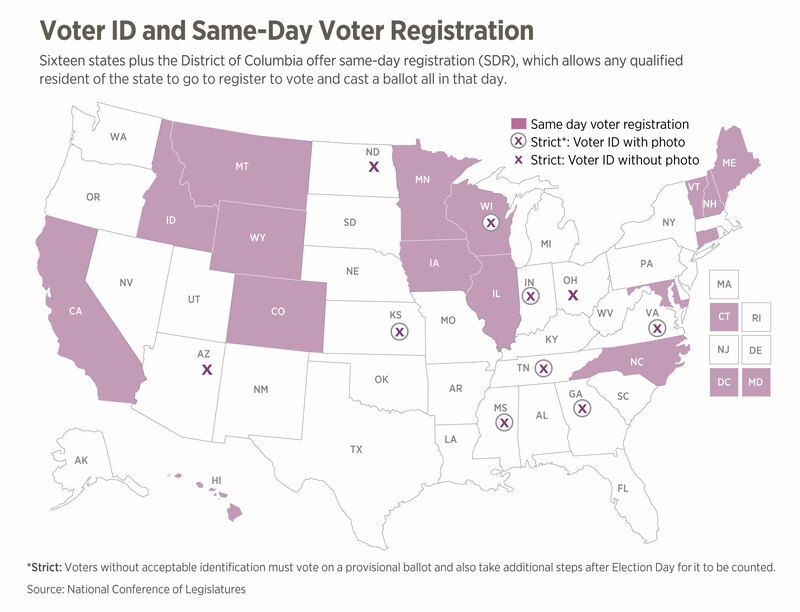 It seems like a simple solution: Make having an ID a requirement to vote, but institute either Election Day or automatic registration. In 2016, West Virginia enacted a first-of-its-kind law that would require identification but would also automatically register its citizens. And yet, a deal has long been elusive, as the politics of an election overhaul are so toxic. In 2009, a proposal that paired voter ID with same-day registration was being worked on behind closed doors in Congress, say sources involved in the effort. Michael McDonald, now a professor at the University of Florida (and an expert witness for the ACLU in their case against Kobach in Kansas), made a few trips to Capitol Hill to look at draft language on a bill that was being negotiated among Republicans and Democrats. 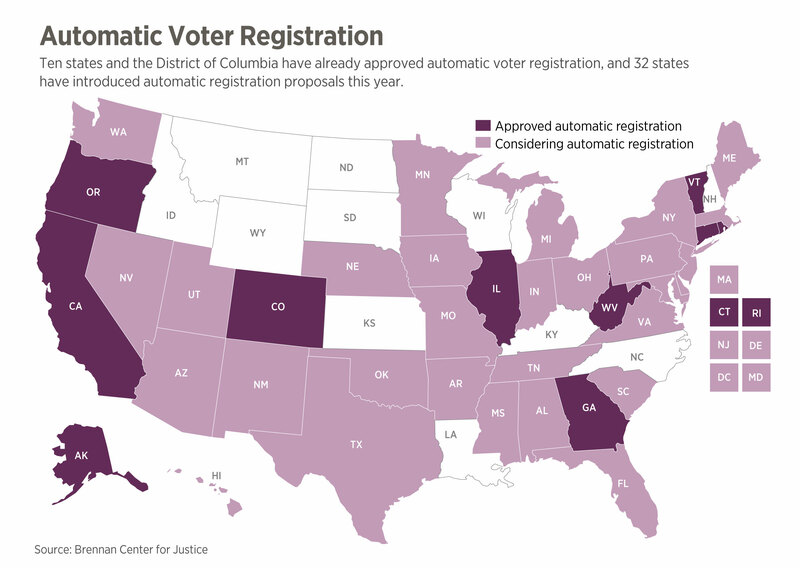 One of the main drivers on the effort was Schumer, who held a hearing in 2009, as chairman of the Senate Rules Committee, looking at barriers to registration. But the effort eventually stalled out and a bill was never released. When Roll Call asked Schumer in August about that failed effort from eight years ago, he said only, “I don’t know. I’d have to check.” A spokesman said he did not have a comment on the matter. That kind of bargain is not being revived in this political climate as both Democrats and Republicans have dug in. Indeed, in recent years, Schumer has publicly decried efforts to expand ID requirements for voting. In 2014, he cited a Government Accountability Office report that said states like Kansas and Tennessee that had instituted some form of voter identification had seen a drop in turnout. In 2012, the Pew Charitable Trusts released a report with some stunning numbers: Across the United States, 24 million voter registrations were invalid, some 1.8 million dead people were registered to vote and 2.75 million people were registered in more than one state. The report, by former Justice Department official David Becker, garnered some press coverage at the time, but it became a sensation in 2016, when then-candidate Trump referenced it on the campaign trail. He also brought it up in a debate with Clinton as part of his effort to convince people the vote would be rigged. The report said nothing about whether actual fraud had taken place. It only noted that voter rolls were not being well maintained, a distinction apparently lost on Trump. “People that have died 10 years ago are still voting,” Trump said at a rally in October. “Voter fraud is very, very common.” Indeed, when Trump was confronted with his mischaracterization by ABC’s David Muir in January, he didn’t seem to understand the difference between out-of-date registrations and actual voter fraud. He accused Becker of backtracking on his findings: “Now you’re telling me Pew report has all of a sudden changed?” he said. “He’s groveling,” Trump said of Becker. Becker, who is now the executive director of the Center for Election Innovation and Research, said he’s constantly rebutting people who twist his findings, which were cited yet again at the commission’s July meeting. “There are vast checks and balances between an inaccurate, old record and a fraudulent ballot cast,” he said. In the five years since the report, he said states have gotten better at cleaning up their rolls. In part, that’s because Becker’s study at Pew helped lay the groundwork for a project that intends to solve the problem of too many dead people and double registrations on the rolls. It is named the Electronic Registration Information Center, or ERIC. Twenty states and the District of Columbia belong to it. It uses multiple databases to weed out invalid registrations. Becker said it has cleaned up about 6.5 million out-of-date voter records since its inception. In a way, ERIC was an answer to another system with the intention of finding invalid registrations, Interstate Voter Registration Crosscheck, which is hosted by Kobach, the Kansas secretary of state. Crosscheck, which was founded in 2005 by one of Kobach’s predecessors, counts 32 states that belong to it. Still, some states, including Oregon and Florida, have ditched Crosscheck in recent years saying that there are problems with too many false positives. The system uses only two matches: name and date of birth, and many experts say that is far too little information. A draft paper by a team of researchers released in January found that the program would purge 200 legitimate votes for every one registration used to cast a double vote. Kobach defends Crosscheck by saying it should be used as the starting point for states to clean up their rolls, not as a be-all-end-all. Becker, who watched the first commission meeting, took note of what he saw as a telling omission. “You’d be excused for not knowing about [ERIC] from the first meeting because nobody mentioned it,” he said. “That’s actually worse data than what Crosscheck does,” he said, noting that some of the publicly available data might only include name, address and birth year — not even a birth date. In the end, some experts believe the fight over the commission will poison the well for what’s really needed: a bipartisan update of the country’s voting laws. Stewart said some of those issues are becoming more urgent. Becker worries that the commission’s “allegations of widespread voter fraud” is part of an effort that will have a profoundly negative impact. “I think it is dangerous if the electorate in a democracy loses its faith in its election system,” he said.